After a stressful and uncomfortable two days of travel in northern Mozambique, we entered southern Malawi looking for a bit of relaxation and a break from the heat. 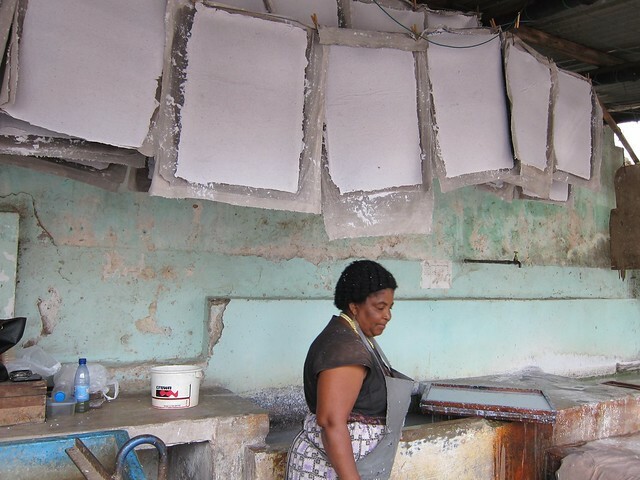 We spent two nights in Blantyre, where we enjoyed a historical tour of the city's oldest building, the international influence of a Hindu temple and a distinctly African take on Indian food, and a tour of a local nonprofit focused on education through paper recycling. 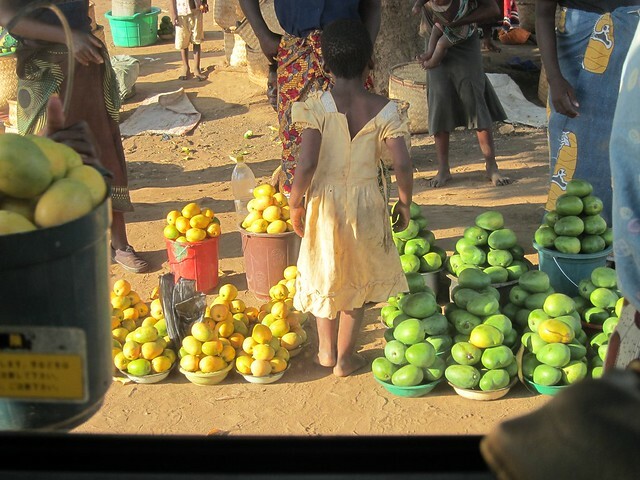 Before long, we were headed on to Zomba, a small village (sister city to Urbana, Illinois!) at the foot of an imposing plateau which we were to ascend to escape the heat. Upon leaving the bus station, we were approached by the usual throng of people trying to sell us onward bus trips, taxi rides, crafts, and various food items, and we politely turned them down, as we had some errands to do before ascending the plateau. As we walked from the bus station to two banks, two supermarkets, and an open-air vegetable market, we were followed by one particularly persistent taxi driver who engaged us in conversation about our home, our jobs, our trip, as well as suggesting to us the best places to go for the supplies we needed. While we have learned so far on the trip to be wary of such pushy salesmen, since in most places they are merely feigning politeness in order to secure our business (and charge us a higher-than-market rate), we eventually came to realize that this man was genuinely polite and interested in us, and he would be an early example of the type of kind and helpful people we would meet all throughout Malawi (although he did overcharge us for the ride up the plateau). We had read that Malawian people were some of the friendliest in Africa, and time and again we've met people with big smiles who wanted nothing more than to shake our hands and exchange a few words with us. It's a nice change of pace from the feeling in Mozambique that everyone was trying to make a buck off us. 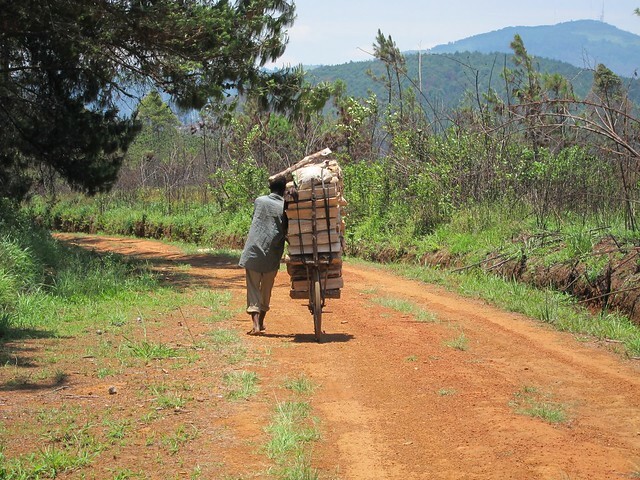 The Zomba plateau really has only two lodging options: a super-posh resort, and a backpacker-friendly spot called the Trout Farm. The resort being out of our price range, we tried our luck at the Trout Farm. On arriving we were told that it was undergoing a change in management and we found the facilities to be a bit neglected, with the trout pond all but dry and all the buildings in serious need of a coat of paint. We had been envisioning a few comfortable days to recuperate from our traveling, and so were a bit put off by the shabby exterior, but without any other real option, we settled in and tried to make the best of it. After a nice pasta dinner and a good night's sleep, things looked a lot better: we focused on the beautiful and pristine surroundings and the fresh, clean, pine-smelling mountain air. The next day was Thanksgiving, and we took a short walk in the morning, past a waterfall and to a vista overlooking the town and surrounding plains, meanwhile passing many men walking bikes loaded with an incredible amount of firewood, then returned to the Trout Farm to work on our Thanksgiving dinner. While we've met many travelers here in Africa, very, very few of them have been Americans, so we had put out a couple of feelers on online travel forums, looking for expats in Malawi's cities to share the holiday with, but weren't holding out much hope. 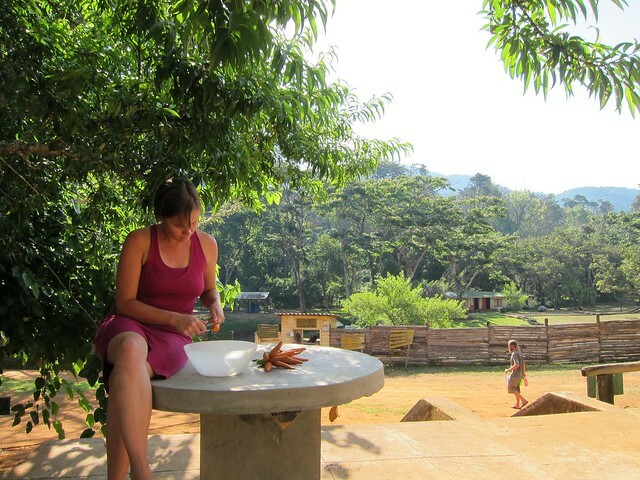 When we didn't receive any responses to our posts, and didn't meet any Americans in Blantyre, we headed up to Zomba, accepting the fact that we'd be eating alone. We picked up a chicken, some sweet potatoes, the ingredients for an impromptu stuffing, and apples to bake for dessert, and didn't think any more about it. After returning from our walk we sat on our porch to rest for a bit, and you can imagine our surprise when two girls with American accents walked into the farm carrying an apple pie! We quickly struck up a conversation--it turns out that they were Peace Corps volunteers in Malawi, soon to be followed by three more friends--and we agreed that we should certainly all celebrate the holiday together. 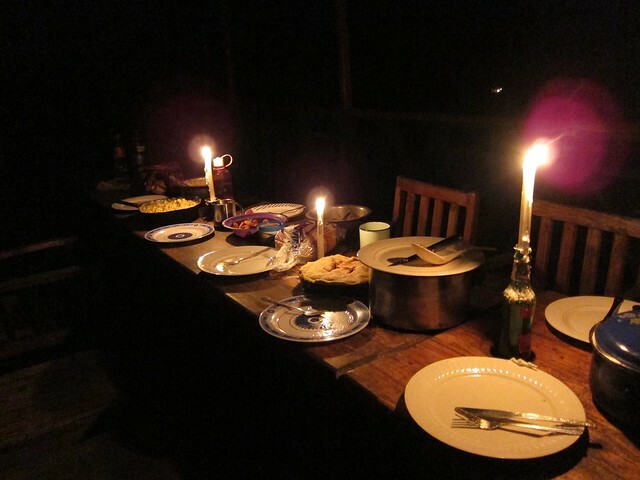 A few hours later we were sitting down to a candlelit dinner on a dock above a dry pond in rural Malawi, with heaping plates of chicken, sweet potatoes, two kinds of stuffing, creamy garlic mashed potatoes, carrots grown in one of the volunteers' gardens, green bean casserole, Velveeta macaroni and cheese (ingredients for these last two sent by the volunteers' concerned families), and of course a turkey, bought from another of the volunteers' neighbor, and slaughtered, cleaned, and expertly cooked by the volunteers. After only meeting two Americans in our first six weeks in Africa, we found it just perfect that we would meet the next five on Thanksgiving day, and it all made for a unique Thanksgiving and one we won't soon forget!